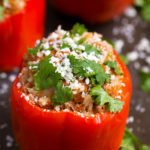 Instant Pot Mexican Stuffed Peppers are so easy to make, and very tasty! A great weeknight meal. Thank goodness for the electric pressure cooker! I use My Instant Pot several times a week. Pressure cooker stuffed bell peppers are always a win in my house. 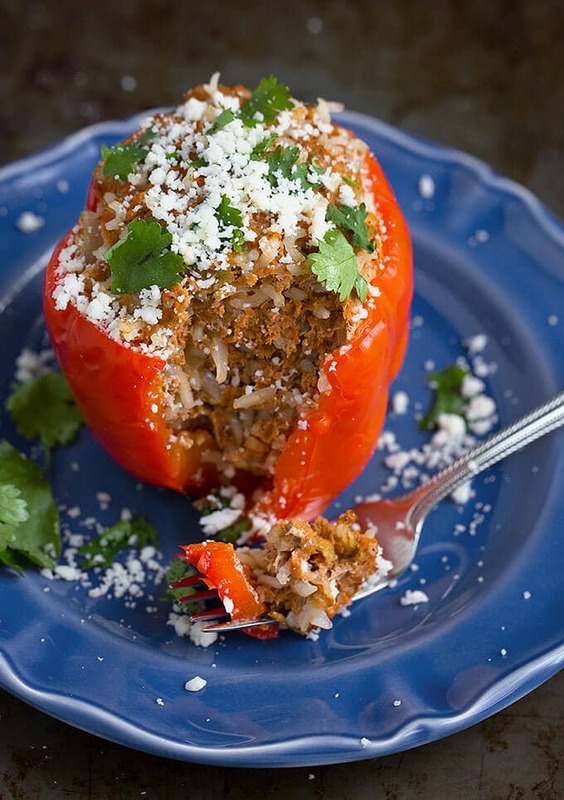 For these Stuffed Peppers, both the meat and the parboiled rice go in uncooked. You can use cooked rice as well, and this recipe is a great way to use up leftover cooked rice! 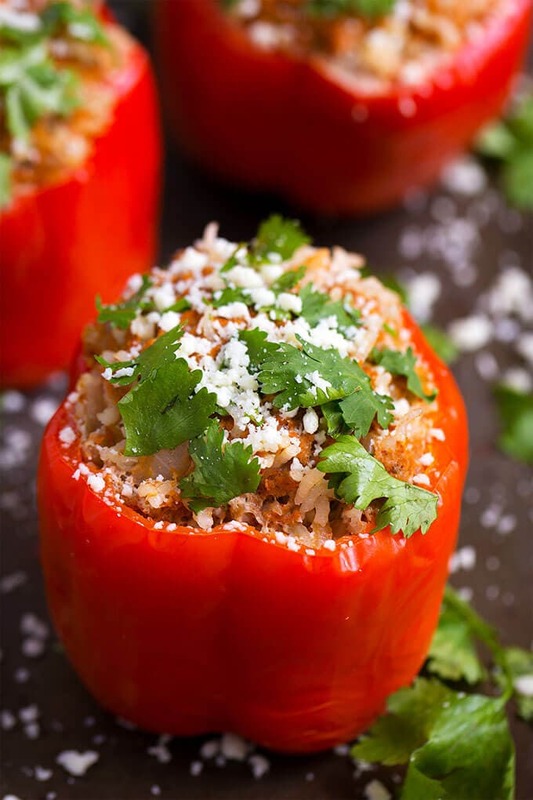 These Instant Pot Mexican Stuffed Peppers are delicious, filling, and healthy. They make a great weeknight meal. Ready in under an hour, how cool is that?! If you want to make a simple sauce to go on top, that’s an option. I like to add salsa and cheese and enjoy them that way. So many options! 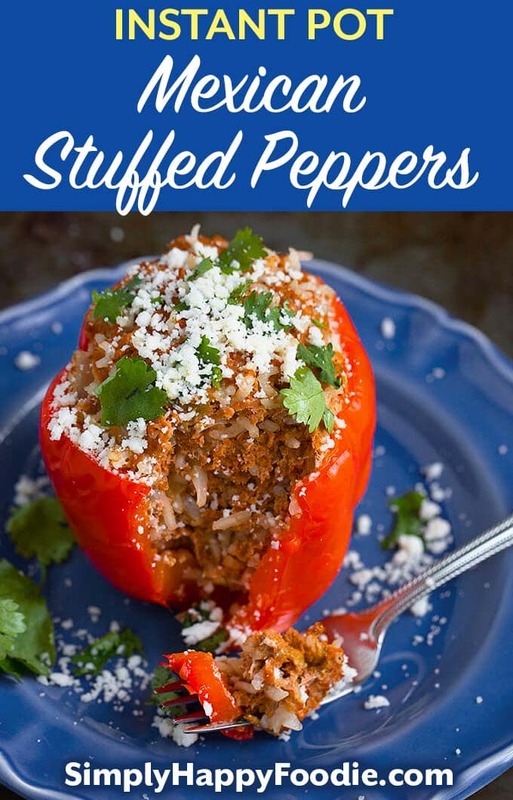 Instant Pot Mexican Stuffed Peppers are a delicious meal, ideal for a busy weeknight because they cook in under an hour. Loaded with South of the Border inspired flavor, these are sure to be a hit! Put the cup of water into the inner liner of the pressure cooker. Rinse the peppers and cut the tops off. Deseed and remove the membrane. Remove the stems from the tops and finely dice them. Add to a mixing bowl. Add the rice to the mixing bowl. Add the ground turkey or beef (raw) and all other ingredients to the mixing bowl. Mix to combine thoroughly with rice. Fill each pepper with enough of the meat mixture to come a little bit above the top of the pepper. Don't pack them too tightly. Place stuffed peppers on a trivet in the Instant Pot. They will be sitting above the water. Put the lid on and close it, turning the steam release knob to the Sealing position. Press the Pressure Cook/Manual button, and the + or - button to select 20 minutes. Make sure High Pressure is selected. If not, press Cancel/Keep Warm, press Pressure Cook/Manual, then the Adjust button to select High Pressure. After the cooking cycle ends, let the pot sit and it will enter the Natural Pressure Release phase, and let it count up to 10 minutes. Manually release the remaining steam by turning the knob to the venting position (carefully). When the pin in the lid drops and all of the remaining pressure is released, open the lid, facing it away from your face. Check the internal temperature using an instant read thermometer. The temp should be at least 165 degrees for ground turkey, and 160 for ground beef. If they aren't fully cooked, put the lid back on and cook for 5 more minutes, then check again. Remove peppers with tongs to a plate and garnish with your favorite toppings! I like cilantro, Cotija cheese, and salsa. Some versions of Stuffed Peppers have a tomato sauce poured over the top. This recipe doesn't, but you certainly could make a quick batch in a small sauce pan. Just use a cup or two of tomato sauce, and mix in some garlic powder, a sprinkle of onion powder, a pinch of salt and pepper, a pinch of oregano, and some cumin and chili powder. Warm it through, taste, adjust seasonings if needed, and pour it over the finished peppers. It's possible you will have some to cook the peppers in two batches if they won't all fit in your pot. You never mentioned when to add the tomato sauce. Is it added to the meat and rice or do you pour over the top or? Hi Jay, When I wrote add all other ingredients, I also meant the tomato sauce, to the meat.